Every once in a while I come across a recipe that simply amazes me. 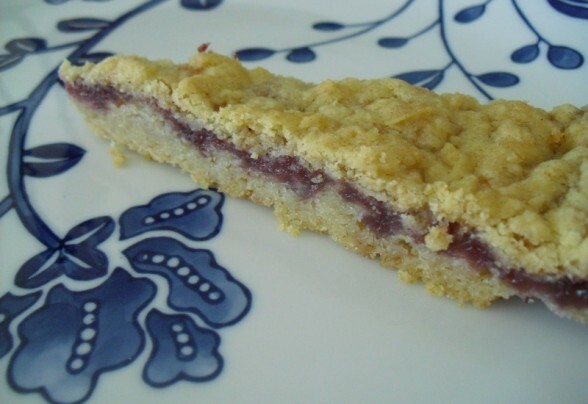 This recipe for Hungarian Shortbread is so delicious and simple, yet impressive. There are several recipes on the internet for this type of cookie, but I think this one is the best. You will need a 10-inch round spring form pan and a large box grater. Most recipes on the web make it in a large glass baking dish, but I find that the spring form pan works the best. The real key to this recipe grating the short bread dough, which makes the texture of this cookie delectable. You can make your own jam filling but I used Trader Joe’s Organic Reduced Sugar Raspberry Preserves. One jar is the perfect amount. The Apricot preserves work really well too and are a favorite filling for shortbread cookies. Here is a link to one that Martha Stewart makes with homemade rhubarb jam -which I am going to try in the spring. Sift together the flour, baking powder and salt. Beat the butter at high speed on an electric mixer until it’s light and fluffy for about 2 minutes. Scrape down the sides and add the sugar and egg yolks, mixing on medium speed – about 4 minutes. On low speed, slowly add the flour mixture. Once the dough forms into a ball, turn off mixer and remove the dough to a lightly floured surface. Pull the dough together gently and cut in half into 2 balls. Wrap each ball seperatly in plastic wrap and place in the freezer for about 30 minutes and up to 3 hours. Preheat the oven to 350 degrees. Lightly grease the 10 inch spring form pan. Remove a ball from the freezer and using the large holes on your box grater, grate the dough directly into the prepared pan. Gently pat the dough down just to make sure it gets to the endges of the pan. Now spread your jam evenly on top of the dough. Grate the second dough ball right on top of the jam layer. Spread the dough just so it reaches about 1/2 inch of the edge. It will look like a crumple topping. Bake for 30 minutes until it’s golden brown. Allow to cool completely before removing the outer ring. Cut into wedges and serve.